What Is the Difference between a Lion and Jaguar? African lions (Panthera leo) and jaguars (Panthera onca) are both well known, and great eco-tourist attractions. They are strictly carnivores, and the top predators in their geographic ranges. But the similarities end there. Where they live, their social behavior, how and what they hunt, and their reproduction are very different. Lions inhabit the grassy plains and savannah of sub-Saharan Africa, but can live in forests, semi-desert and mountainous habitats. You won't find them in deserts or tropical rain forests though. Lowland tropical rain forests are jaguars' main habitat, though they can survive in others, including deserts. Found in parts of North, Central and South America, the greatest concentration of jaguars is in the Amazon Basin. Lions are 4.5 to 6.5 feet in length and weigh 270 to 600 pounds. They have short, tawny coats that blend with the grasslands where they live and hunt. The mature males have long manes that can be blond through to black. There are no official records of lions with black coats. Jaguars are a similar length, but their lean, muscular bodies only weigh between 150 and 300 pounds. Their coats are a pale yellow to red-brown and covered in black rosette-shaped spots. Black jaguars -- black base coats with just visible black spots -- are fairly common, and both coats are good camouflage in dense forest. Lions live in groups called prides with about six related females, their dependent young and a coalition of two to three males -- the number of lions can vary. The males will only be with the pride for a few years before it's taken over by a new coalition, but the ousted males then stay together. Jaguars are solitary creatures, only living together when mothers have cubs and dependent siblings, and briefly to mate. Lions -- mainly females -- hunt as a team. This helps them catch prey, such as zebras, antelopes and wildebeest, which are often faster than lions. One lion bites the muzzle or throat of the captured prey, throttling it. The males usually bring down large prey like water buffalo and giraffe. Lions are able to gorge and then not feed for a week, and will leave anything they don't want for scavengers. Jaguars eat almost anything they can catch -- more than 85 species have been recorded as part of their diet. They stalk prey on the ground and leap from trees or rocks onto the ambushed animals below. Jaguars' broad head, powerful jaws and strong canine teeth allow them to bite through their preys' skulls. They will bury or hide food for another meal. Jaguars are good swimmers and will hunt fish, turtles and caimans. Lions rarely go into water. Female lions can reproduce at 4 years old, males at 5. Females mate with a male from their pride and can have one to six cubs, three is usual. Mothers keep their young hidden until they are 8 weeks old, at which time the cubs join the pride, and female lions share nursing and caring for them. 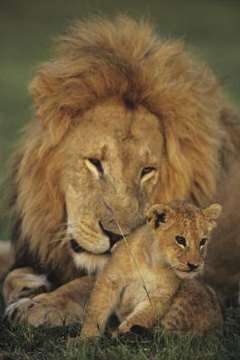 The males, as long as they are in charge of the pride, protect the cubs. If a new coalition takes over, they will usually kill the previous males' young offspring. The cubs are weaned at 7 to 10 months old, but are dependent on the adults until at least 16 months. Female jaguars can reproduce at 12 to 24 months, males at 24 to 36 months. It's the females who go and look for a mate. The males then follow the females back to their territories to mate. Jaguars can have one to four cubs, two is usual, and their mothers provide everything for them -- nursing, hunting, teaching and protection. The cubs are weaned at 5 to 6 months, but are dependent on their mother until about 2 years old. Do Lions Have Multiple Female Mates? When Do Lions Stop Caring for Their Cubs?